The ICB Financial Accounting Qualification will give you all the skills and knowledge you need to be an indispensable part of any organisation. The TWP Academy ICB Financial Accounting Qualification takes you from National Certificate in Bookkeeping, right through to a National Diploma in Financial Accounting at NQF level 6. This qualification will also give you access to higher studies if you want to take this career further. Every company needs to understand what is happening with their finances. You need to know if you are making profits, or whether you company is actually running at a loss and just running up big debts with suppliers. Management needs to make decisions daily about how much money to spend on different areas of the business, and if they do not have accurate and up to date information on the finances of the company these decisions can get a company into serious financial problems. These financial reports are given to the decision makers in the company so that they can make good financial decisions about where to spend money. If a company fails to keep good financial records it puts itself at risk in a number of ways. Firstly there are allot of laws governing how you must record the financial transactions in a company, so you may end up in trouble with the law. Also, you cannot make sound financial decisions if you are not keeping careful records and make accurate reports for management. Thus it is very important that every company has an excellent finance team that has financial accounting training. The TWP Academy ICB Financial Accounting qualification is broken into 4 levels, and you get a qualification on the successful completion of each level. Here are the details of the TWP Academy ICB Financial Accounting qualification. This qualification will take you 12 months, and you can be a Junior Bookkeeper, Accounts Clerk, Reconciliation Clerk, Payroll Clerk, Accounts Payable/Receivable Clerk once you have completed all your exams. You need to be 16, and how a grade 10 or equivalent to study this program, and you don’t need in prior accounting knowledge. That means this is written assuming you know nothing about accounting so there is no need to be intimidated. Once you have your further Education and Training (FET) Certificate: Bookkeeping you will be able to work as a Technical Financial Accountant, Financial Manager, Financial Services Manager, Accounting Technician or a Tax Technician. TWP Academy prides itself on excellence in service, and a high contact model of instruction. TWP Academy was created by Together We Pass. Together We Pass has been helping home study students pass their home study courses since 2008. In this time they have seen first hand the difference it makes when an institution partners with their students, rather than allowing them to struggle on alone. Here are some of the services from TWP Academy that help students pass their qualifications. TWP Academy has full time lectures on site, which is highly unusual for a distance learning college. All lecturers are highly qualified in the field that they teach, and have years of experience in tutoring home study students. If you get stuck with your accounting qualification, and let’s face it with accounting this is a high probability, would you prefer to be able to contact your lecturer immediately for her? The TWP Academy lecturers are on call every weekday during business hours in order to help all students as quickly and effectively as possible. TWP Academy was created by Together We Pass, and so there are over 8 years of experience running study groups for home study students. This means you will get the best study groups help there is. Your TWP Academy lecturer will be in the study group daily, helping students, posting relevant academic material, and even motivational posts to keep students focused on completing their qualification. At most institutions you only get help from your lecturer if you contact the college and book time with the lecturer. However, at TWP Academy your lecturer will be actively engaging in the study group every day. This high contact model is essential to make sure that students are able to get the most out of their studies, and get qualified as quickly as possible. The academic team at TWP Academy is dedicated to excellent service, that is quick to respond, that helps the student right first time, every time. The academic support team has years of experience, with over 30 years combined experience across the team. The Academic Head has won a national innovation award, and been nominated as one of the top 100 innovators in education technology globally. Using a combination of smart technology and personalised contact where it is needed TWP Academy is dedicated to ensuring no student is left behind. Every student needs to feel that they are the most important client the college has, and must get the support they need to succeed. That is the mission of the TWP Academy Academic Support team. 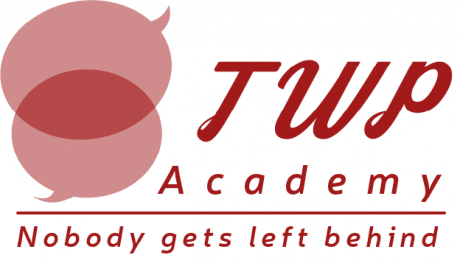 Do you want to know more about TWP Academy? If you are interested in any of the TWP Academy offerings please contact them directly. Or you can look on their website at: www.twpacademy.edu.za.